As a quality-conscious firm, we make sure that the offered lot is sternly packed using the best quality packaging material. However, we source the packaging material from the genuine vendors. Based is Delhi (India), we are entrusted with the chore of providing top-notch products in the domestic market. 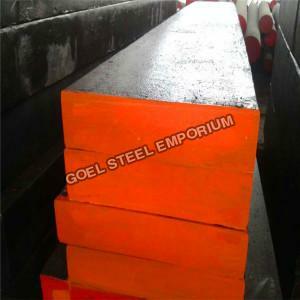 We are one of the trusted H13 Tool Steel Suppliers in Delhi. Standard and Grade : AISI H13, JIS SKD61, ASSAB8407, DIN1.2344. Applications : Suitable for making of aluminum, zinc and copper alloy extrusion dies, casting dies and hot shearing blades, etc Small silver Polish steel (scaled and cold drawn), which is an ideal material for ejection pins and sleeves. Also suitable for manufacture of plastic molds of high productivity and long service life. Standard and Grade AISI H13, JIS SKD61, ASSAB8407, DIN1.2344.